The building used by Hawkes House was formerly a more traditional public house known as The Barrel. First opened as an off-licence in 1859 it was then known as ‘The Ale and Porter Stores’. Thus of all the pubs in centre of Thornbury, Hawkes House has the shortest history – all the others having been opened earlier. When James and Simon set about converting this pub they wanted to give it a new name indicating a change of image. They wanted a name with some historical connection to Thornbury and they chose the Hawkes House using part of the name of the Hawkesworth family who ran several inns in the town in the seventeenth century. Although the Hawkesworths had no connection with any pub on the site of the Hawkes House, they did run one nearby in what was on the site of the present Town Hall. That pub was called The Tavern. They were also associated with The Tygers Head, a pub on the site of 51 and 53 High Street (now Riddifords shop and the adjoining property). Hawkes House is now clearly located on St Mary Street, but before the re-development of the shopping centre in the late 1960’s and subsequent re-building of the pub, its only entrance faced Silver Street. We haven’t seen the deeds of the pub, but we are fortunate to have been given a copy of a booklet ‘The Barrel Story‘ by local pub historian, George Ford who was brought up in the pub when his parents held the licence. We have also used records held in Gloucestershire Records Office, census, electoral registers, trade directories and local newspapers. ‘a desirable freehold property consisting two very substantially built ranges of buildings, one comprising double coach-house, stable, brewhouse and rooms over; the other consisting of a large stable and harness room with rooms over; together with yard and good walled garden, … the whole presenting a frontage to Silver Street of 118 feet 6 inches or thereabouts and to St Mary Street of 40 feet or thereabouts‘. Thus there were two parallel buildings both bounded by Silver Street and Soapers Lane and separated by a yard. On the plan shown here the New Police Station’ is at the left end of the two streets and the two buildings bought by Thomas Arnold are at the right end of the two streets. The main stable block is on the right fronting St Mary Street and the coach-house and brewhouse was located behind (on the other side of the yard). Note that there was then a pump in the yard between the two buildings indicated by the letter ‘P’. The 1859 and 1862 Rate Books confirm that ‘Arnold & Co.’ had taken over as owners of this rear part of the property. It was then occupied by William Bevan. Arnolds already had connections with Thornbury and prior to 1859 they had been renting a property in St Mary Street where they had been running a Porter Stores there. That property was on the site of what we became known as The Plough and presumably they ceased their interest in that property when they acquired the Rolphs property. We understand that George Ford managed to see some old documents in possession of Whitbreads who owned the pub at the time. In his book ” The Barrel Story” George mentions that Arnolds acquired the property in 1859 for £259. George says they started trading as an off licence under the name of ‘The Ale and Porter Stores’. In the 1861 Census William Bevan and his wife Ann occupied this property. William was described as the Ale and Porter Stores keeper. In the Slater’s Trade Directory for 1868 it is noticeable that William Bevan was described as a “Beer Retailer” although his business was not listed in the licensed premises for that year in the same directory. This may be another indication that it was still trading as an “off-licence”. We note that by the time of the 1871 census the then licensee of the ‘Ale and Porter Stores’ was described as ‘inn keeper’ so we assume that this means they were selling drinks for consumption on the premises by that time. Around 1879 to 1882 Arnolds undertook a major rebuild of the old coachhouse to create a new bar with living accommodation over and in a single story extension built on the rear. The name of the business was shortened over the years to become ‘The Porter Stores‘. In 1882 the Petty Sessional records show that the Porter Stores was licensed to sell beer, cider and perry. Thomas Arnold who bought the property in 1859 was the son of Thomas Arnold who had started his brewery in Wickwar High Street in 1800. In 1820 he formed ‘Arnold & Co’. This was initially only a small brewing enterprise and by 1851 he was only employing 8 men. Thomas senior died in 1853 and the business of ‘Arnold & Co.’ seems to have been taken over by Thomas junior. The business appears to have been expanded quickly in the next few years. The property at Thornbury was acquired in 1859, a new brewery located near the railway station at Wickwar was opened in 1860. The 1861 census shows Thomas Arnold was now employing 101 men, 5 boys and 9 women. It’s possible that Thomas over-reached himself. He took out loans arranged with his brother in law, Thomas Halsey (who had married Thomas’s sister in 1848) and various properties including the Porter Stores in Thornbury were used as security. By the time of the 1881 census Thomas Hasley and his wife Sarah had moved to live in Wickwar and Thomas Halsey got more involved in the business. The census describes him as a brewer. The London Gazette reported in 1883 that the partnership of Thomas Arnold and Thomas Halsey had been dissolved that Thomas Halsey would continue to run ‘Arnold & Co.’ on his own. In 1886 Thomas created his limited company Arnold & Co Ltd after combining with the firm of E & B Trimmer of Gloucester. In 1887 Arnold and Co Ltd merged with H. & A. Perrett of Wotton Under Edge who had their Bournstream Brewery at Wotton Under Edge and 325 tied houses. The new company was called ‘Arnold Perrett & Co Ltd.’ This company went on to take over several other companies all over the south west. In 1924 Arnold Perrett & Co Ltd was taken over by Cheltenham Original Brewery Company. This company changed its name from the Porter Stores to The Barrel. It was described as The Barrel in the 1926 Prewett Directory. We don’t know why they changed the name or why they chose the name of The Barrel. In George Ford’s book he puts forward several theories, the most likely reason being the fact a valuation document dated 1911 showed that there was an extremely large 60 gallon barrel in the pub. In 1946 the name of the owners changed to Cheltenham and Hereford Breweries Ltd following a merger with Hereford Breweries. 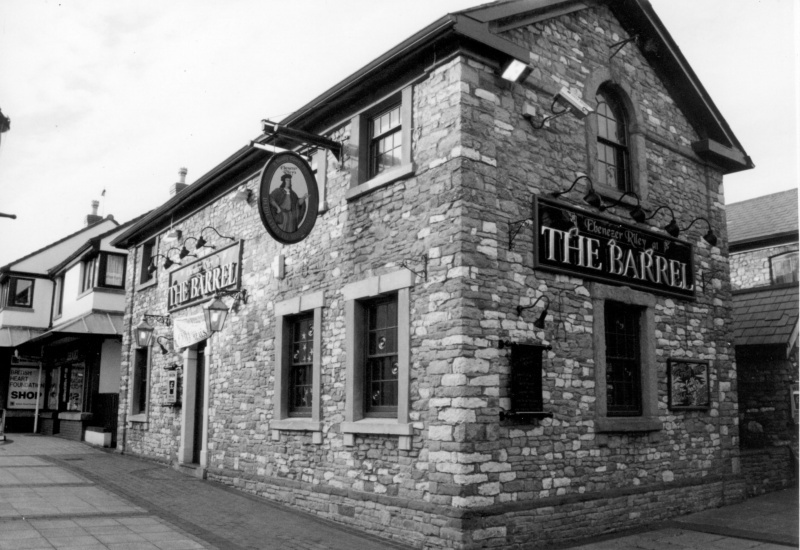 The Barrel was a beer and cider pub throughout the early 1900s. It was not until the early 1950s that it got a licence to sell wine. After the brewery combined with the Stroud Brewery in 1958 they became known as West Country Breweries. Then in 1962 Whitbread took over the West Country Breweries. 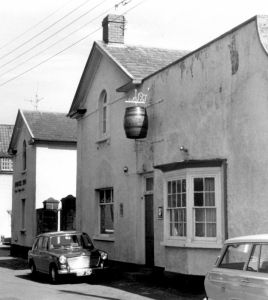 In the late 1960s there were plans to re-develop Thornbury town centre and there was a threat to demolish The Barrel. It survived this threat and in 1982 Whitbread undertook a major re-development of the site. The new building joined together the two older parts of the property and provided a much larger bar space with an area for dining in place of the yard and the separate function room. In 1997 Whitbread made an attempt to re-brand the pub by changing its name to Ebenezer Riley Old Coach House. After objections by locals, a compromise was reached allowing the name of ‘Ebenezer Riley at The Barrel‘ to be displayed, but insisting that the words ‘Ebenezer Riley at’ were in small letter and The Barrel’ were in large letters. This format is shown in the photograph below (click on the image to make it larger). Within a short time, any reference to Ebenezer Riley was dropped and it reverted to being known as The Barrel. Whitbreads continued to own the Barrel until 2002 when they sold it along with all their other pub outlets to Enterprise Inns. The pub struggled to compete with the other pubs in Thornbury. As the number of drinkers using pubs decreased it struggled to fill up the large drinking areas in spite of its central location in the shopping centre and attempts to provide live music and to attract younger drinkers. It finally closed in early 2012 and lay vacant until it was converted into the Hawkes House in late 2013 by James Murray and Simon Extance.